This TT685N camera flash applies to Nikon cameras and is compatible with I-TTL II autoflash. 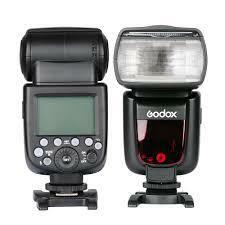 With this I-TTL II compatible flash, your shooting will become simpler. Support for I-TTL II autoflash, 1/8000 high-speed sync, flash exposure compensation, flash exposure lock, modeling flash, etc. Two Transmitting Styles to Offer Creative Light Effect,Optic transmission with even illumination and stable output,2.4G wireless transmission with all-in-one functions and 100 meters further transmission. Convenient Dot-matrix LCD panel,With dot-matrix LCD panel to offer clear and easy operation.